Pacific seems to be on a mission to bring DW-like features, looks and quality to the masses. The finishes alone belie the price point that they occupy. While a couple of aesthetic points such as the incomplete black hardware stand out, there is no escaping the fact that these are handsome, all-maple drums that do the business. Any drummer on a budget seeking to add something exotic to his or her kit would be wise to take a look. Beautiful looks, impressive sounds, great value. A few minor details could be improved on. The newest batch of snares from Pacific is a progression from their established SX Series snare drums. However, whereas the SX wooden snares are only available in natural finishes, the SXE range are a blaze of colour. Also among their ranks is a pair of solid shell snare drums - previously only available as a DW top-notch option. Pacific´s DW lineage is obvious here. The range is subtitled Exotic and the drums boast a superb lacquer finish which wouldn´t look out of place on DW Collector´s Series snares. Two of the models also feature black hardware. The SXE range is divided into three fundamental size/ construction configurations: 14"x5½" or 14"x6" conventional 10-ply and 14"x5" solid shell drums. With every option the shells are all maple and are equipped with 10 lugs. Currently, the finish/hardware configurations are not interchangeable - the black hardware is only available on two of the drums and cannot be supplied with other models. Choices of finish for the 14"x6" drums are Amber lacquer over birdseye maple with chrome hardware. Alternatively, opt for a Charcoal Fade lacquer over Kurillian birch with black hardware. The outer ply of the drum is made of birch. Colour-wise, the lacquer moves from a deep, warm brown to sepia-tinged ochre. There is only one 14"x5½" drum, and it comes in a Deep Red Stain lacquer over Tiger ash with black hardware. The outer ply is of ash (this is the red drum). The two solid shell snares are distinguished by finish alone. The Charcoal Fade lacquer over Kurillian birch features again, this time with chrome hardware. The alternative is Burnt Toast lacquer over birdseye maple with chrome hardware. All of the finishes are absolutely stunning. Part of the visual appeal is that the wood used is full of naturally occurring features. Flecks, curls and wisps swim beneath the lacquer, heightening the beauty of the finish. All the drums come with a new snare throw-off lever identical to that found on DW snares. Its chunky clasp throws off away from the drum, so it is possible to click it back on with your knee. American-made Remo heads are fitted top and bottom as standard. DW´s patented True-Pitch tension rods (with a finer thread than standard tension rods, making for more exact tuning) are found on all the drums. The drums with black hardware feature black hoops, lugs, air holes and snare wire butts. However, only part of the snare throw-off levers are black-coated and the chromed elements stand out. An inconsistency that detracts from the cool feel of black hardware. The tension rods are excusable as True-Pitch rods only come in chrome or gold, and gold is not available at this price. However, the collars on the lugs that accept the tension rods (and protrude for 10mm either side of each lug) are also chrome and simply emphasise the length of the tension rods. The 14"x6" drums all feature 10-ply maple shells (where the lacquer is over birch or ash the drums are nine plies of maple with the final outer ply being of the finish wood). All of the 14"x6" models are on the lively side. Wide open they´re prone to overtones: small, but unwanted buzzes and rings. With a touch of dampening they calmed down and delivered impressive woody retorts. They had something to offer through a range of tunings, fattening up as tension was dialled out and producing biting authority at the other end of the scale. 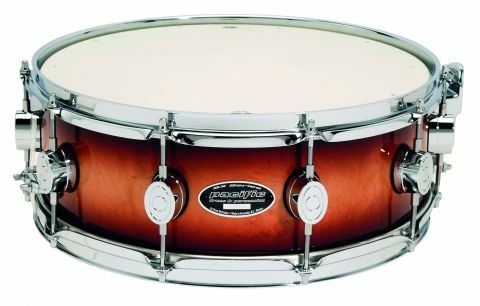 Solid snares are not new to Pacific´s parent company DW. The best-known exponent of solid snares is Johnny Craviotto. DW previously marketed solid snares under his name. With Johnny now fronting his own company, DW has reverted to selling own-brand solid snares. The technique remains exactly the same: steam bending a single piece of wood into a cylinder. The resulting shells are 8mm thick and the drums feel suitably weighty. Unlike most solid snares, the Pacific models don´t include reinforcing rings. The extra wood that such rings bring encourages the fundamental pitch of a drum to go higher. Leaving them out not only helps reduce materials and costs but will help the drum perform well at lower tunings. Both solid snares produced a formidable crack regardless of tuning. The density of the shells creates a core sound impossible to dilute. At any given dynamic, the drums had an unmistakable presence: good at responding to brushwork, controlled when hit dead centre and penetrating when rim shotted. Solid stuff indeed.